Historic Clinton Square and Erie Canal. 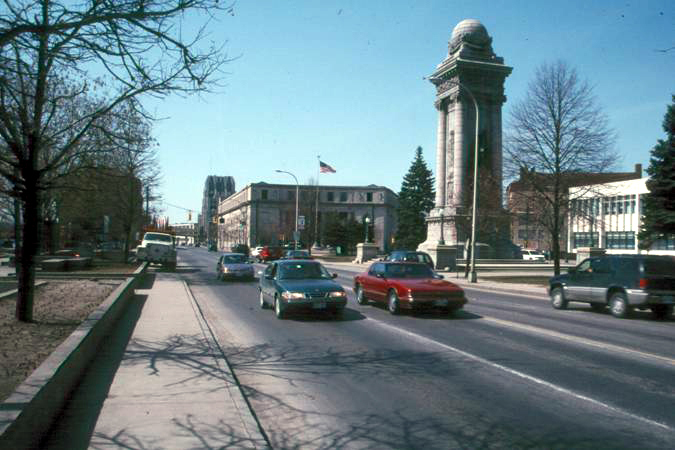 In 1999, PPS worked with the City of Syracuse to develop a plan to bring vitality back to downtown Syracuse. 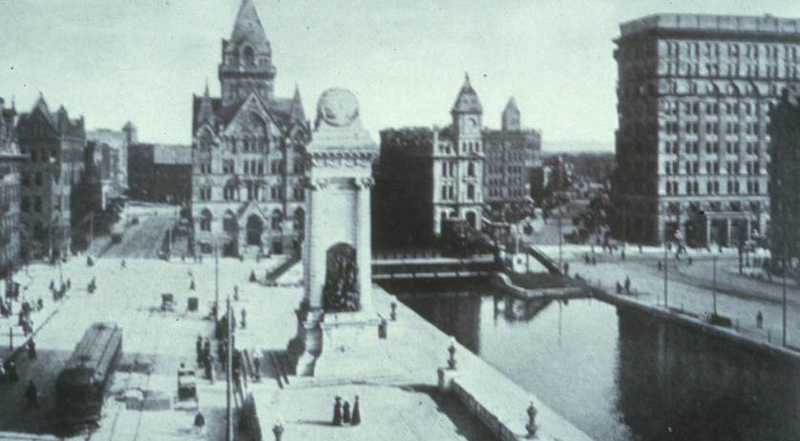 Centrally located within Syracuse and on the Erie Canal, Clinton Square was historically the site of many public activities, including an extensive market and, in winter, ice skating on the frozen canal. The construction of the Soldiers and Sailors Monument, a Civil War memorial, in 1910 was symbolic of the square's importance, and served as a focal point for parades and public ceremonies. However, in the 1920s, the Erie Canal was filled in, and Erie Boulevard was constructed, bisecting Clinton Square with busy lanes of traffic. Though banks, offices, and new uses, such as the Syracuse newspapers and the federal building, existed within the historic buildings on the square, the square itself was greatly underutilized. For many years, returning Clinton Square to its former uses as a pedestrian space and site for public events was a dream of the City of Syracuse. Preliminary concept plans for Clinton Square were drawn up by PPS in conjunction with Clough, Habour & Associates LLP and SG Associates. The space was designed with the involvement of the local community and with the aim of creating an inviting place. Rerouting traffic around the square was also a major part of the plans. It was predicted that the proposed changes could improve the traffic flow in the area, decreasing safety risks and air pollution. The opening of Clinton Square in September 2001 met with rave reviews and the square is currently a spectacular civic plaza for festivals, farmers' markets, concerts and ice skating. 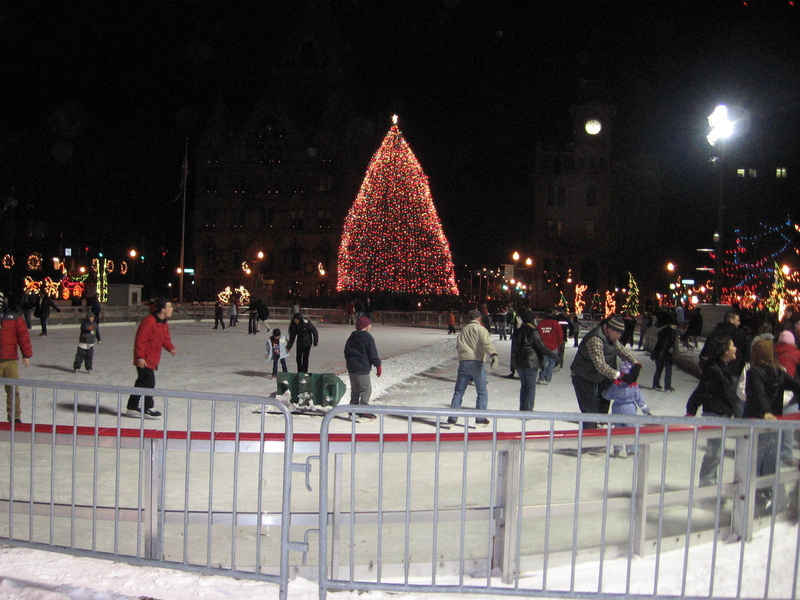 Ice skating is a popular activity during the winter months, and approximately 60,000 people used the ice rink during the 2006-2007 season. Summertime festivals held in Clinton Square include Taste of Syracuse, which drew 75,000 people to the area for the two day event in 2007. Overall, over 200,000 people use Clinton Square each year. Follow-up studies performed since the square reopened determined that area traffic has reduced by 13 to 16 percent, air pollution emissions have decreased by 15 percent, and economic development in the area has increased. Formerly vacant buildings around Clinton Square are being converted into ground floor shops and restaurants, while upper stories are being developed as apartments, some of the first new residential units to be constructed in Syracuse's central business district in many years. A local resident summed up the impacts of Clinton Square, saying, "the new Clinton Square is the best thing that has happened in Syracuse in 50 years...It works wonderfully as celebratory space with the reflecting pool drained. But the square in its spare everyday beauty, with the reflecting pool and fountain, is what will win the hearts of citizens everywhere." City of Syracuse; Metropolitan Development Foundation of Central New York, Inc.
Erie Boulevard, when it bisected Clinton Square. The new Clinton Square in winter.